Looking to capitalize on flights of the company’s deep space Orion spacecraft, Lockheed Martin recently announced that it is seeking input from the commercial market for co-manifested payloads on future missions. On October 5, 2018, at the 69th International Astronautical Congress (IAC) in Bremen, Germany, the company announced that it wanted to gauge interest in opening commercial opportunities on flights of its crew-rated ship. The announcement capped a busy week for the company at the conference as it had previously revealed its plan to develop a reusable Lunar Lander for use with the Lunar Gateway. “Access to the Moon and deep space for commercial entities opens up new worlds for all of us. It advances science, powers innovation, and inspires a new generation of engineers,” stated Lockheed Martin Space’s Orion program manager and vice president of Human Space Exploration, Commercial Civil Space, Mike Hawes, in a press release issued by the company. 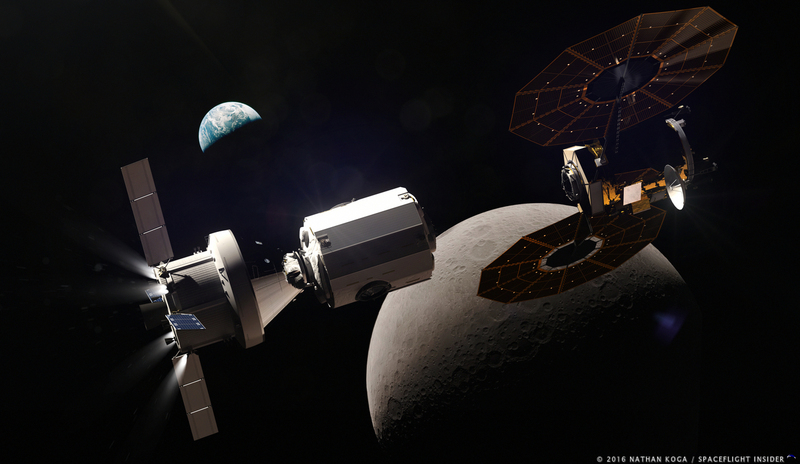 By bringing in commercial partners early in the program, Lockheed Martin contends that customers will help to standardize on the systems used to to support the payloads — not just on Orion, but expanding to projects like the Lunar Gateway and missions to Mars. To this end, the company has partnered with NanoRacks for the study. NanoRacks, with a history of managing an active payload program on the International Space Station, seemed to be a natural fit for Lockheed Martin. “We’ve seen that model work on the International Space Station in low-Earth orbit, and now, working with NanoRacks, we’re applying that same successful model to deep space,” noted Hawes. Indeed, the partnership between the two companies has the potential to provide customers with a reliable and comparatively affordable method to deliver payloads to beyond low-Earth orbit. “At NanoRacks, we pride ourselves on knowing exactly what our commercial customer needs are for a growing number of in-space platforms and knowing how to deliver efficient services at a competitive price. That is why we see this effort with Lockheed Martin as a win-win,” expressed NanoRack’s CEO and Co-Founder, Jeffrey Manber, in the same release. “Lockheed Martin brings unmatched capabilities in engineering, mission management, and deep space vehicle design. The solicitation for commercial payloads is open to both U.S.-based and international organizations, and covers a broad range of of areas, from communications and STEM fields to art and entertainment. Lockheed Martin states that there may be opportunities to fly payloads on the first three flights of Orion on NASA‘s Space Launch System (SLS). These missions, designated Exploration Mission-1 (EM-1) through Exploration Mission-3 (EM-3), will see Orion and SLS transition from uncrewed test flight to the first phase of the construction of the Lunar Gateway. It is important to note that, while NASA is aware of the solicitation, there is currently no formal arrangement under which this could be officially undertaken. I don’t quite understand this. LM doesn’t own Orion capsules nor the launch system. Are they making seeking this at the behest of NASA? As far as I understand they are contractors to NASA and NASA (US Govt.) owns the design of Orion and SLS. I guess they could license it from the US Govt. and build their own vehicles and launcher and then sell the service to commercial customers.